There is one post filed in photographer. Born Gaspard-Felix Tournachon – French photographer, caricaturist, journalist, novelist, and balloonist (or, more accurately, proponent of manned flight). 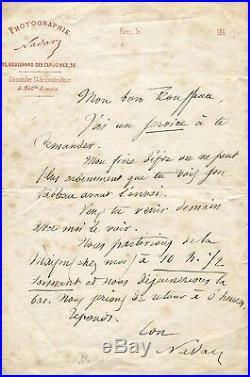 Autographed letter signed, one page, 5,25 x 8 inch, `Photographie – Nadar` letterhead, (London), (Paris), in French, to his friend Rousseau – Nadar asks his correspondent a favour, written and signed in black ink “Nadar”, with a small tear (0,4 inch) to the right edge, scattered mild creases and stains – in nearly fine condition. Mon bon Rousseau, J`ai un service a tu demander. Mon frere désire on ne peut plus ardemment que tu vois son tableau avant l`envoi. Veux tu venir demain avec moi le voir. Nous partirions de la maison (chez moi) a 10 h. Sonnant et nous dejeunerions la bas. Nous ferions de retour a 6 heures. Translated: My dear Rousseau, I would like to ask you for a favour. Wants you to see his tableau before dispatching it. Let us have a look at it tomorrow. We leave from home (at my house) at 10 1/2 a. Ring and we will have breakfast there. We will return at 6 p. Our Identification Number: 6013235. Satisfaction Guarantee – If you are not satisfied with the autographs you can return them within 15 days without giving reasons. We do not offer any Autopen-, Secretarial-, Stamped- or Pre-Print autographs. Certificate of Authenticy – We stand 100% behind all the signatures that we offer! You will receive each autograph with a fine certificate of authenticity with a unique identification number. This service is to our knowledge unique, as illustrated certificates only bring a proof of origin in case of emergency. All prices include VAT. We are unable to accept any foreign cheques. You will receive your order securely packaged and presented neatly within a few days. Please do a google research for “brandesautographs” 2. In our autograph advice guide we will endeavour to answer the questions that we are most often asked on the subject of autographs. Now take some time to read this sections; advice that will help you to keep long and respectful you for autographs! Take a look to our Feedback and Testimonials 5. We are in business for autographs for more than 25years and maybe have Europeans largest reference library in this field. Markus Brandes is passionate in collecting autographs and manuscripts for more than 25 years and since 1997 Markus Brandes Autographs serves worldwide the needs of clients and stands for high class authentic signatures in all areas. If you have any questions or suggestions, drop us a line as we love hearing from our customers. The item “PHOTOGRAPHER Gaspard-Felix Tournachon `Nadar` autograph, handwritten letter sign” is in sale since Thursday, June 8, 2017. This item is in the category “Collectibles\Autographs\Other Collectible Autographs”. The seller is “brandesautographs” and is located in Kesswil. This item can be shipped worldwide.